Having been a huge fan of Pop Evil for many years I was wholeheartedly convinced that I'd never see them live, such is the ambivalence to their particular brand of Rock music in my home country. The UK remains out of bounds to many American bands just as it did back in the eighties when Britain was seemingly unaware of bands like Journey and their ilk. What has changed in recent times however, is the increase in the number of bands that has gained traction in this country with music fans fed up with being force-fed manufactured tripe from reality TV. There has recently been something of a backlash, with Rock fans willing to go out of their way to watch quality Modern Rock live. Planet Rock must take credit for bringing new bands to the fore, along with magazines such as our own Fireworks. Black Stone Cherry, Alter Bridge, Airbourne and Theory Of A Deadman all enjoy success in Britain despite a total lack of TV or radio coverage and album sales and three band bills seems to be where it's at. Step forward Pop Evil, whose dabbling with Rock and Funk make them somewhat unique. Never in all my years of attending concerts – and that goes way back to the eighties – have I seen a support band get such a reception. Vocalist Leigh Kakaty worked his audience and, after the initial apathy, he had them eating out of the palm of his hand. They raced through an entertaining set where the band combined past glories, like '100 In A 55', 'Bosses Daughter' and 'Last Man Standing', with the more up to date offerings, such as 'Trenches', 'Deal With The Devil', 'Behind Closed Doors' and 'Torn To Pieces' (from the memorable 'Onyx'). The latest album ('Up') has divided opinion with its back to basics approach and groove-orientated sound, but the live translation of songs like 'Ways To Get High', 'Footsteps' and the rabble rousing encore 'Take It All' showed what the band are aiming for. It was all high quality and one of the best performances from a support band that I've seen. On this evidence, the only way for Pop Evil really is up. 3 Doors Down haven't played in the UK for four years and tonight's performance was, in effect, their comeback gig. Ravaged in recent times by the death of former guitarist Matt Roberts and the arrest and subsequent imprisonment of bassist Todd Harrell – he's now on permanent hiatus – for vehicular homicide, the band has come back with a new(ish) sound and two new members. 3 Doors Down get accused of being boring live, but Chet Roberts (the band's former guitar tech) and new bassist Justin Biltonen have added some much needed vitality to the bands live set. 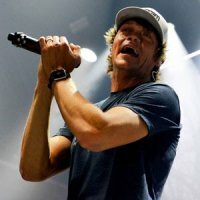 Many acts fail spectacularly to replicate their recorded sound live due to studio trickery that papers over the cracks; 3 Doors Down aren't one of those bands. Indeed, their live sound is perhaps as close as you will ever get to the studio recordings and that's testament to their musicianship. Vocalist Brad Arnold never does anything spectacular, he just sings it like he can; in tune and filled with Southern emotion. Tonight was no different and it was business as usual. The set-list had been freshened up with the addition of new songs from 'Us And Them', plus there were the addition of songs that hadn't been in the set for a while. A stirring version of 'Believer' was promoted from encore to a higher placing in the running order, whilst Arnold's ode to Britain 'Landing In London' made a welcome and apt appearance. Old favourites were seamlessly included as 'Kryponite' closed the main set-proper and Arnold's taught emotional delivery of 'Away From The Sun' was (and always is) a joy to behold. The slightly lighter material culled from 'Us And The Night' was given more of an aggressive edge live and songs like the bouncy 'In The Dark' or the strangely 'The Better Life'-sounding 'Still Alive' were given the necessary "oomph" required. The Acoustic Rock interlude of 'Pieces Of Me' illustrated that the band had lost nothing, from the chiming guitar of Chris Henderson's through to the crisp percussive touch of Greg Upchurch, the band were as good musically as they had ever been. Just to prove the point, we were treated to four encore songs, including a spine-chilling rendition of 'Here Without You' – sang word perfect by everyone of the two thousand strong audience – plus the final song 'When I'm Gone', a complete reversal from its position of set opener on the 'Away From The Sun' tour some thirteen years ago. 3 Doors Down really are a revelation the way they just keep doing what they do. Perhaps the band aren't at the peak of their powers any more, but they put most other Rock bands to shame with their musicianship and connection with the fans. Ironically, they're more popular now than they've ever been in the UK, I sincerely hope that they don't wait another four years before returning to these shores.